After the year of research and organization needed to create Boatless in Seattle, I was interested in a quicker project. When I read in the Society of Children's Book Writers and Illustrators Bulletin that there was a call for submissions from Lee and Low Books for emergent readers with a multi-cultural theme, I got to work. Writing for young children is akin to writing poetry. Every word must count, and must be within the reading ability of the child. This book has seven pages and eight words, but it tells a story! The publisher translated it into Spanish, and both the English and Spanish editions are used as part of reading programs across the United States. I love the rich illustrations by Don Tate! 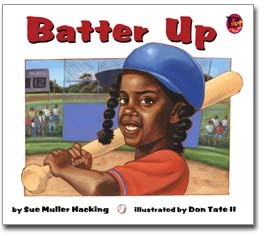 Synopsis: An African American girl scores for her team by hitting a home run.